One of the great advantages of being a digital photographer is that you can take pictures of you, your family and others enjoying hobbies and interests other than photography. 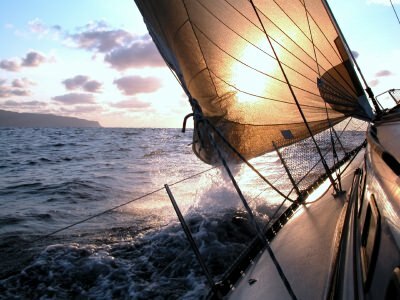 A popular activity is boating; and market research reveals that most boat owners also own cameras and often photograph their boats, other boats and other nautical subject matter. Plus, a boat is an excellent platform from which to take pictures of the natural environments of lakes, rivers and the sea. Regardless of what kind of boating pictures you are taking, onshore or onboard, think about and plan the composition of your photos. Move as close to your subject as possible. Move yourself or your camera to eliminate clutter or distractions in the frame. There are many articles in the PhotographyTalk.com Library with more compositional tips that will help you improve your boating, or any, digital photography. The most important tip is that water and cameras don’t mix. Take a camera and a bag filled with equipment on a boat, or any body of water, and you increase greatly the possibility of water, especially seawater, either ruining your camera or costing you a large repair bill. You don’t have to be in a boat. Standing on shore (beach, dock or pier) can also make your camera vulnerable to water damage. It isn’t necessary to drop your camera in the water either. Even a fine, almost invisible, spray of water can negatively affect your camera, lens, etc. Leave your camera bag open on deck or a dock and it doesn’t take much water to flood it and ruin every item inside. Learn more about protecting your camera equipment in many situations in the PhotographyTalk.com article, Digital Photography—What To Do When the Quirks of Life Threaten Your Camera. Of course, you could take the gamble that water will never enter the inside of your camera because you’ll be very careful. Don’t fool yourself. There are simply too many elements that you can’t control on board a boat and even on shore next to the water. Your two best options are to use a disposable, waterproof camera or rent or buy an underwater housing for your camera. Your plans may not include shooting underwater, but the water can come to you and your camera in a flash. Many of the disposable, waterproof cameras have land and underwater shooting modes. If water enters your camera or it’s immersed in water, then you have an emergency situation. You must open and dry the camera immediately, and then take it directly to a repair shop. Even that immediate action doesn’t save most cameras; and the amount of the repair bill, if your camera can be repaired, may be better applied to a new camera. Read Part 2 of this PhotographyTalk.com article for more tips and techniques for better boat photography.